(without stand or speakers) 18.5" x 13.1" x 2.6"
Sharp's LC-19SB28UT is a widescreen high definition LCD TV with a slim design and distinctive small footprint. It features a high-performance LCD panel for high brightness, a high contrast ratio, low-reflection glare protection and wide viewing angles. The LC-19SB28UT includes ATSC/NTSC tuners to receive off-air broadcasts as well as digital cable QAM capability to receive non-scrambled digital cable programming. In addition, the LC-19SB28UT is PC compatible and is a computer monitor for greater versatility. 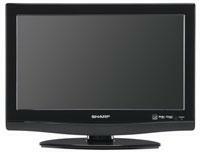 As an HDTV monitor, it is compatible with 1080i and 720p signals from HDTV sources. * 16:9 Aspect Ratio (1366 x 768) ASV LCD Panel - displays 16:9 widescreen programs in their native aspect ratio. * Built-in ATSC/QAM/NTSC Tuners - for DTV and available analog TV viewing. * High Brightness - Sharp LCD TVs are very bright, so you can put them virtually anywhere - even near a window, a door or other light source - and the picture is still vivid. * HDMI® Input - for convenient connection to digital devices. * High Contrast Ratio - provides incredible images whether you're watching dark or bright scenes. * PC Input - easily turns your LCD TV into a PC monitor.